It’s the most wonderful time of the year. A time when families get together to celebrate the birth of Jesus and exchange gifts. But how much thought goes into whether the gifts we purchase have come at the expense of others? We all—generally speaking—have the best intentions of getting our Christmas shopping done and dusted well before December to avoid the hordes of shoppers. Very few of us are actually able to do this, with life (and procrastination) getting in the way. When we do finally get started, how many of us think about whether or not our Christmas gifts are ethical? Fair trade is at times little more than a buzz word. But it’s more than something we utter to appear socially aware to our friends. Fair trade is all about better prices, decent working conditions, local sustainability, and fair terms of trade for farmers and workers in the developing world. To get a fair trade certification on your products is actually quite the hassle—there’s lots of criteria to satisfy. So when something is marked as fair trade, you can be sure it really is. You can read more about this in our ethical guide to Christmas from last year and pick up some tips about your coffee, chocolate and tea purchases. Alongside the production of food, two of the biggest areas we can impact with our shopping are clothing and electronics. By biggest, we mean areas where people are most likely to be exploited. But where does one even start to navigate this? Luckily our friends at Baptist World Aid have done the hard yards for you. Their initiative Behind the Barcode is a series of industry reports which seek to empower customers to purchase ethically and, by doing so, encourage companies to ensure workers are protected, rewarded, and can work free from the tyranny of modern slavery. Their reports grade companies from A-F on the systems they have in place to protect the workers in their supply chain from exploitation, forced labour and child labour, and the level of their transparency regarding these systems. One of the biggest grey areas when it comes to shopping ethically for clothing is knowing what has been made by workers who are paid fairly and work in safe conditions, and what has been made in sweatshop conditions. Despite internationally agreed upon labour rights, there are still more than 45 million people globally who are modern-day slaves. A major concern is the hours clothing factories expect their employees to work. These workers can put in 12 to 18 hours a day, sometimes seven days a week, plus forced overtime, unsafe working conditions, and pittance pay in return. Sadly, the majority of workers in the global fashion industry rarely earn more than A$2 a day. When you consider the international poverty line is $1.90 a day, this is deeply concerning. This injustice isn’t solely at the hands of the factory managers—when prices paid to suppliers are cut by brands and retailers, it is the workers who suffer. You can read Behind the Barcode’s ethical fashion guide here to find out which companies you can safely purchase from. Labour exploitation is rampant in the production of electronic goods. With long working hours for little to no compensation similar to the fashion industry, workers in electronics factories are also exposed to hazards such as toxic chemicals and metal dust. PVC (polyvinyl chloride), BFRs (brominated flame retardants), lead, cadmium (used in laptop batteries and computer contacts) and mercury (used in lighting devices for flat screen displays) are toxic chemicals widely used in electronics. These chemicals can cause brain damage and intellectual impairment, and harm kidneys, bones, and reproductive systems. Another area of concern is conflict minerals—the natural resources which are illegally mined and exported from conflict zones to be used in the production of electronics. The trade of conflict minerals finances violence and armed conflict and is linked to sexual violence and torture. The nature of conflict mineral extraction also makes it extremely dangerous, with workers forced to work in poorly-constructed mine shafts prone to collapse without protective clothing or equipment. You can read Behind the Barcode’s ethical electronics guide here to find out which companies you can safely purchase from. A living wage is a wage that allows workers to afford the basics—food, water, shelter, clothing, power, healthcare and education—for themselves and their dependants, and still have a little left over for emergencies or discretionary spending. A living wage is recognised as a human right, yet the reality for the vast majority of workers is that wages are set so low that their families remain trapped in a cycle of poverty. In 2016, one-third of fashion companies could prove they were paying above minimum wages but merely two per cent could prove they were paying a living wage. Just two per cent of electronics companies could prove they were paying above minimum wages to their workers. If companies do not disclose, or are unwilling to disclose, what they are doing to ensure workers are not exploited in their supply chains, then it becomes near impossible for consumers and the public to know if these brands are investing sufficiently to mitigate these risks. Publishing supplier lists is a way companies can demonstrate to workers, consumers and the public that they are committed to being held accountable to the workers in their supply chain. In 2016, just 16 per cent of fashion companies and 36 per cent of electronics companies published a full list of suppliers. To know products are being made ethically, companies need to have strong systems in place to protect workers from raw materials, all the way through to final stage of production. It is deeper in the supply chain, where cotton is farmed and minerals are extracted, that the most shocking forms of child and forced labour occur. Disappointingly, only five per cent of fashion companies know where all their raw materials are sourced and no electronics companies have fully traced their raw materials, meaning there are significant risks of exploitation in most of the clothes and all the electronics we buy. Get informed. Find out which companies and brands don’t adhere to ethical guidelines and the fair treatment of their workers. Speak with your wallet. Refuse to buy from those companies and brands in favour of more ethical choices. Speak up. "Speak up for those who cannot speak for themselves, for the rights of all who are destitute. Speak up and judge fairly; defend the rights of the poor and needy.” Proverbs 31:8-9. As a consumer, write to companies and demand fair working conditions and compensation for their workers. Tell them why you’ve chosen to shop elsewhere. Hold them to account for the injustice they are supporting. Your voice is your greatest weapon. Alongside supporting good development work, Compassion purchases our ‘gifts’ from local vendors to stimulate the local economy and create economic growth for communities, so Gifts of Compassion are an excellent choice for the ethical shopper. With 16 gifts starting from as little as $5, there’s something for every budget! Each and every gift gives children living in poverty the practical support they need to learn, grow and look forward to a bright future, while your loved one receives a beautiful card to represent the gift purchased in their honour. Make an ethical choice. 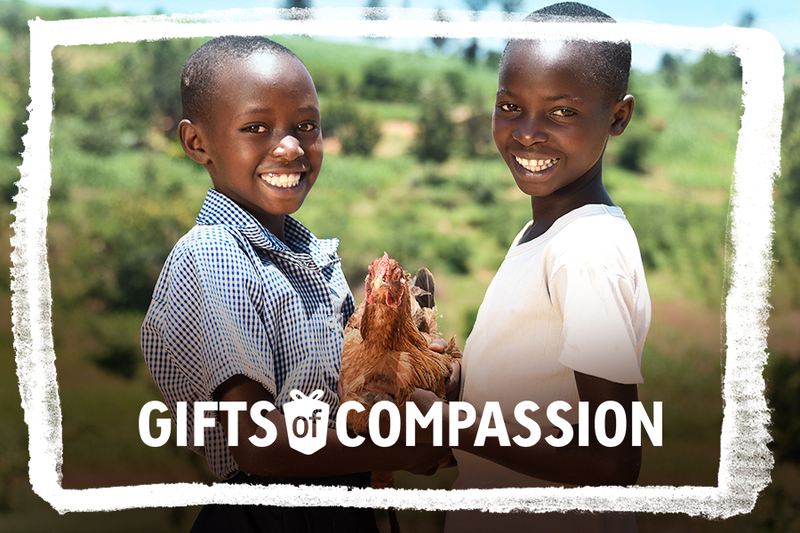 Buy a Gift of Compassion today. Behind the Barcode Shop Ethical!